Cucumbers are a popular plant for home gardeners to grow. From the gourd family, they’re joined by squash and melons as creeping plants that produce edible fruits that can be peeled and eaten raw. I like mine sprinkled with salt and pepper, or of course they can be pickled. The cucumber was first grown in India, but now appears all over the world. More cucumbers are grown in the United States than any where else. These plants need to grow up. 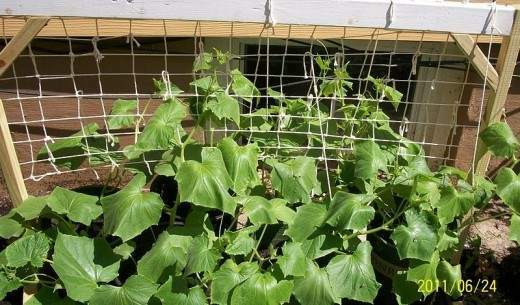 As vines, they need support from lattice, poles, or chicken wire. Some people allow the cucumbers to grow on the ground, but if you do you’re opening yourself up to disease and mildew problems. I grow my cucumbers every year in a large raised bed. I have two, 25-foot rows with chicken wire supports. This way, I can keep a close eye on the plants and keep the fruit picked off before they get to large. They are best at 3-5 inches long and three inches around. At this size, they can easily be peeled and eaten raw or pickled. Did you know that Charlemagne had cucumbers growing in his garden in 9th century France? They were introduced in England in the early 14th century but they were not accepted by the people until 250 years later. Christopher Columbus of Spain, who was once thought to have discovered America, brought cucumber seed to Haiti in 1494. The Mandan Indians grew cucumbers in the 16th century in area now known as North and South Dakota. Today cucumbers are very popular in the U.S. You’ll even find fried dill pickles being cooked and served in some parts of the country. I make them all the time and serve with ranch dressing. If you’ve never had it, you should try cold cucumber soup. It’s delicious also. Cucumbers can be pickled in many ways for longer shelf life. Everything from dill to garlic pickles can be made from cucumbers. Then you can enjoy your cucumbers n the middle of winter! 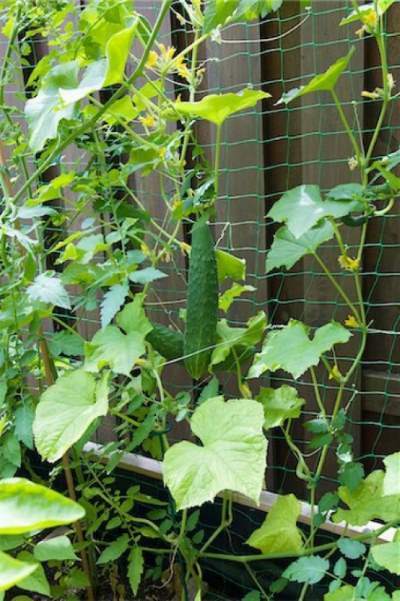 These cucumbers will be easy to harvest. Just walk along the fence and pick. 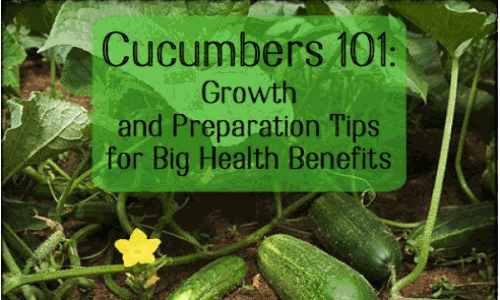 Cucumbers need a lot of attention while growing, but with proper care they produce large amounts of fruit. 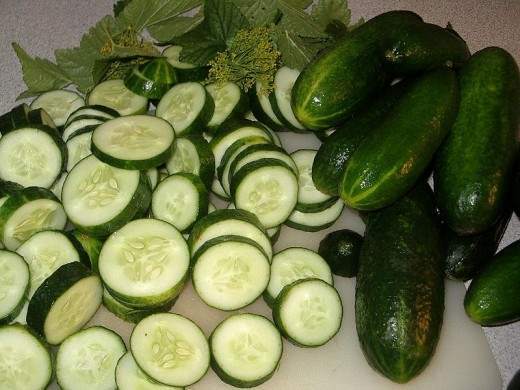 Six plants can produce enough cucumbers to last a family of four through the summer. The plants require warm weather and will mature quickly, so they can be grown almost anywhere. Cucumbers grow from seed in 55 to 60 days. I suggest providing plants with stable support. The fruit produces a lot of weight. 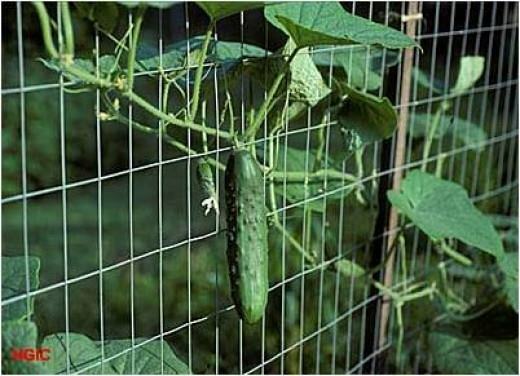 I have fence posts about eight feett tall along the rows where I grow my cucumbers with chicken wire attached. The vines grow along the wire. Plants grown up on supports are less prone to disease and mildew and you’ll get better-formed cucumbers. There are many varieties, but all can be pickled or eaten raw. Look to see how disease-resistant a variety is. One great variety is known as “country fair.” They are seedless, burpless, not bitter, and resistant to disease. This variety is perfect for pickling. When in doubt, ask at your local farm and garden center which kind of cucumber grow best in your area. Cucumbers need fertile soil with good drainage. Dig up the soil to a depth of 12-14 inches and work in rotted manure or compost plus 1/2 pound of 5-10-5 fertilizer for every 10 feet of planted row. Fill the trench with top soil. When you are ready, set out cucumber plants or plant seeds two inches deep. I like to plant already started plants because I get a jump on the season and have cucumbers ready to harvest sooner than anyone else. You can start your own plants indoors in peat pots. I recommend using seeds that are gynoecious, which produce mainly female plants and more cucumbers. Cucumber beetles spread bacterial wilt. You can use a pesticide such as methoxychlor or carbaryl to kill them, but be sure to follow directions carefully and don’t apply when the cucumbers are in full-sun. Always pull out and dispose of any wilted plants. Don’t put sick plants into your compost because the wilt disease can grow there. Every year after harvest, prepare the planting area and soil for next year. Cucumbers will grow much better vertically than they ever will on the ground. If you have a front porch that can be sealed in with plastic for the winter, then you’re in luck. My porch faces east and I lay down rugs on the floor and cover the screened windows with thick green plastic that has fabric inside. I use an electric heater that has a thermostat to keep the temperature on the porch at 72 degrees at night. Purchase seeds for Picklebush cucumbers at your local garden supply store or online. Midget Bush Pickler is another variety that grows indoors in winter. Plant your seeds according to package directions in containers. Use a mix of 80% top soil and 20% 10-10-10 fertilizer. Use a small paint brush to pollinate your plants. Go from flower to flower, gently pushing the tip of the brush into each flower. This will do the same thing a bee or insect would do. Feed once with low-nitrogen, high-potassium, time-release pellets (9-15-30) after the first true leaves appear. Once the plants have three to four sets of true leaves, feed once a week with a low-nitrogen, high-potassium fertilizer (9-15-30). I use metal tomato cages to encourage my vines to grow up and over. You want the soil to feel moist but not wet to the touch. Don’t drown your cucumbers or your plants will die and not produce. You shouldn’t have to worry about beetles or other pests indoors. Cucumber beetles can get in however in late spring, so watch out for them. You can also easily grow cherry or plum tomatoes and various other varities of squash indoors in winter. I have also moved cayenne peppers that I have in large pots indoors in winter and they have produced pepper all winter. In about 45 – 60 days, you will have cucumbers to harvest, even in the dead of winter. You can speed things along by putting a long tube grow light just above the plants and set it to go on at 6 a.m. and off at 6 p.m. 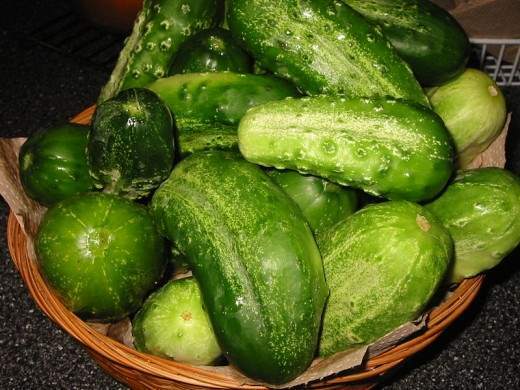 If you grow cucumbers indoors in winter please tell us all about it below in the comment section. Cucumbers can be sliced and then chilled. You can sprinkle the cucumbers with salt and pepper or marinade them in vinegar for an hour or so. These are perfect pickling size. In Western folk medicine, cucumbers are used as a laxative and a diuretic. Used externally, the juice is found to be soothing for the skin and helpful for treating inflammation and burns. First introduced in China around 200 B.C., cucumbers are said to have detoxifying properties in Chinese medical practice. They are also used to soothe dry lips. People with sore throats are often given finely chopped cucumbers to eat. The roots, stems, and leaves are also used, especially to treat diarrhea and dysentery. These parts of the plant are dried in the sun, ground up by hand with a mortar and pestle, and stored in containers with tight-fitting lids. There are reports from China that parts of the cucumber plant are effective in treating high blood pressure. In the American South, a soup is often made from overly ripe cucumbers and given to people with sore throats. It is said to work very well. Also in the United States, peeled cucumbers are pureed in the food processor, mixed with a little mayonnaise, and used as a facial mask to prevent and cure acne. Award Winning Chef For Over Forty Years. Hello as you can see my real name is Thomas Byers. I am a award winning Chef with about forty plus years of experience and I love to cook and share recipes. I’ve won many barbecue and chili cook off contests. In the last forty plus years I’ve won over $150,000 in cash prizes for my cooking. In 1998 I was named number 3 In The 10 Best Chefs In Florida.